A list is connected to your subscribers, and your newsletter. You can have unlimited lists in Ubivox, but we recommend to have as few as possible. By using the segmentation options in Ubivox, you can manage all your subscribers from one list, and segment you delivery, based on information from data fields. Read more about using one list here. An unlimited number of data fields can be created in the system, i.e. name, zip code, gender etc. which makes it possible to segment and mailmerge in your newsletters. By creating data fields you will also be able to generate a sign up formula and to collect information about your subscribers. If you delete a list, all of the newsletters and recipients stored on this list are deleted as well. The data fields are created separately, and won't be deleted, but the content connected to the recipients is deleted. We recommend that you use the default list unless you have specific needs. We recommend this as segmentation is already possible and there is therefore no need to add new lists. List title - only for internal use. Language - influence the messages the subscribers receive when subscribing to the list. Sender name - the name that is seen in the subscribers inbox (Nb. It can always be change under 'list details'). Sender e-mail address - the sender address that is visible in the content subscribers receive (Nb. It can always be change under 'list details'). Primary data fields - are related to the data fields that are to be included in a sign up formula, if this is created later on. All settings can be changed later on in list details -> edit settings. 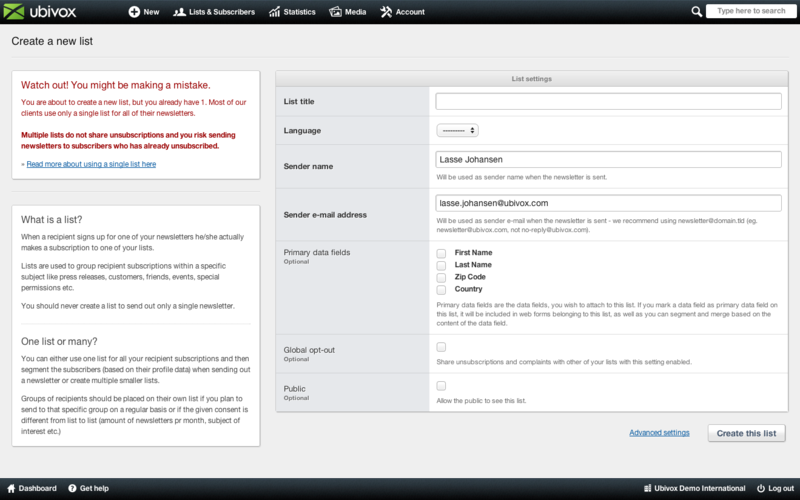 If you wish to store data on your subscribers, then you have to create data fields. 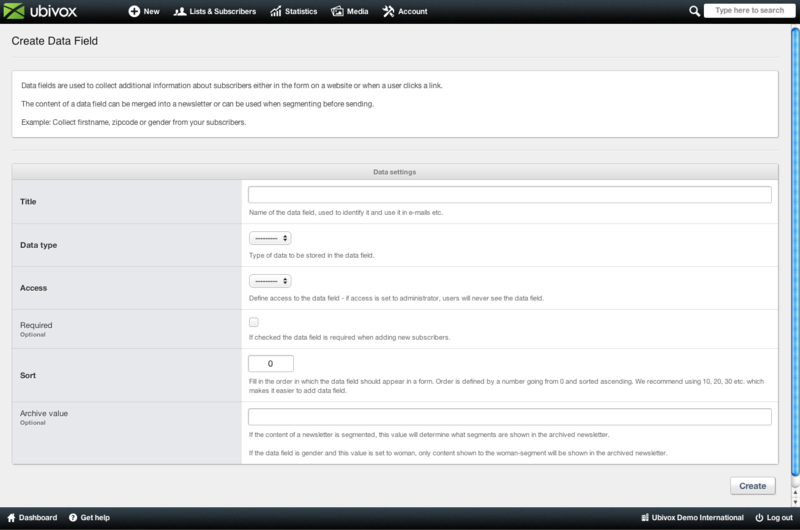 You can then use onclick actions to gain even more knowledge about your subscribers. Data fields are managed in Lists & Subscribers > Data fields. Click on Create new data field and fill out the fields. 3. 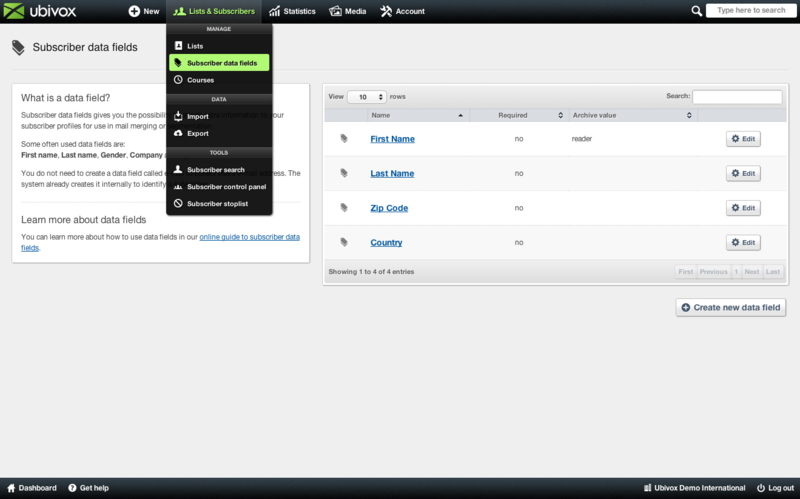 Access - choose Shown to users if the field is going to be used for the web formula. Choose Only visible to administrators for data fields, if they are not be visible in the web formula. It can always be when you create the web formula. 4. Required - if this is chosen, the subscriber have to fill out the field when signing up for the newsletter on the website. 5. Sort - is used to to organize the data fields in the correct order. Is also mostly relevant for the web formula. Choose for instance, 10, 20, 30, so when you add a new data field, you can place it as number 9, or 15, depending on where you would like it to be. 6. Archive value - this will be shown in an archive version if mailmerging has been used how to mailmerge, or segmentation on section level. I.e. if you write "Dear Lars", and you write "Subscriber" in the archive value, then it will say "Dear Subscriber" in the archive version of the newsletter. Ubivox automatically generates a HTML code which can be inserted on your website, based on the list settings, data fields. You need to set up an Opt-in e-mail before this is possible. This guide elaborates opt-in and the advantages of using a double opt-in instead of an ordinary opt-in. Five ways to increase reader engagement through storytelling. 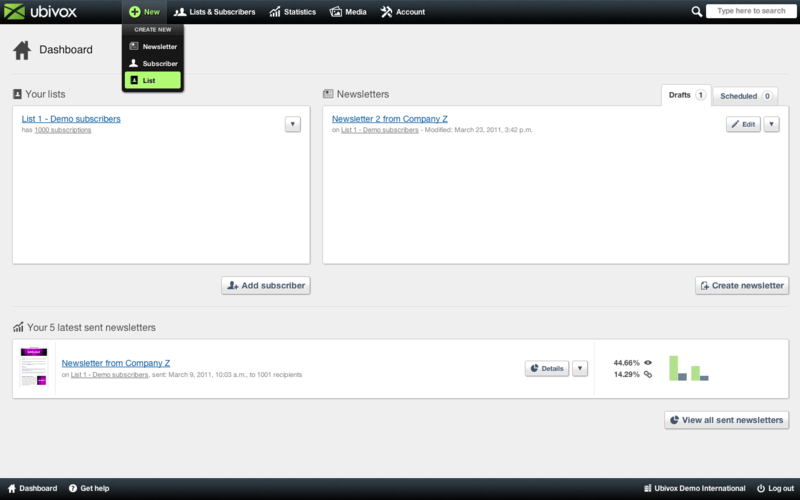 In Ubivox you can make a QR code that works as a sign up formula for your newsletter. This guide elaborates and exemplifies how you create a QR code to your Ubivox list.